No one in comics drops the mic like Marvel. 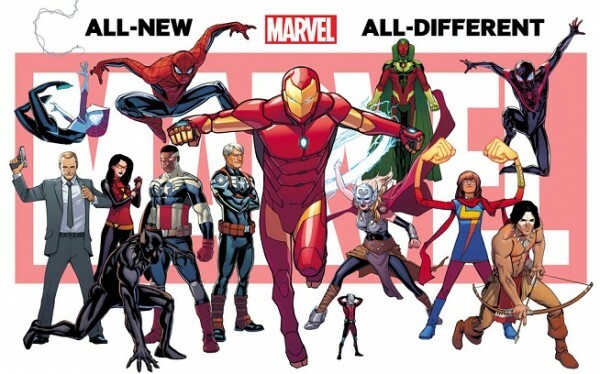 While press agents with Cable-esque guns stress it is not a reboot, Marvel will unveil its whole post-Secret Wars line-up in a special edition of Marvel Previews, July 1. This new line of around 60 titles will include a Doctor Strange with an axe, old man logan, Thing as a member of the Guardians of the Galaxy, Citizen V of Thunderbolts fame and both a new Hulk AND Wolverine. Yup, sounds like a reboot to me (bang!) That bullet got my shoulder but I can still continue. What do you think? Of the reboot? (Bang!) Okay, that one hurt. I definitely have mixed feelings about the this new MU myself. Reed as the Hulk? What!? The Return if Citizen V? I don't know if anyone was particular clamoring for his return. I'd have gone for Darkhawk and or/Sleepwalker myself. Don't get why X-23 was chosen over OML. 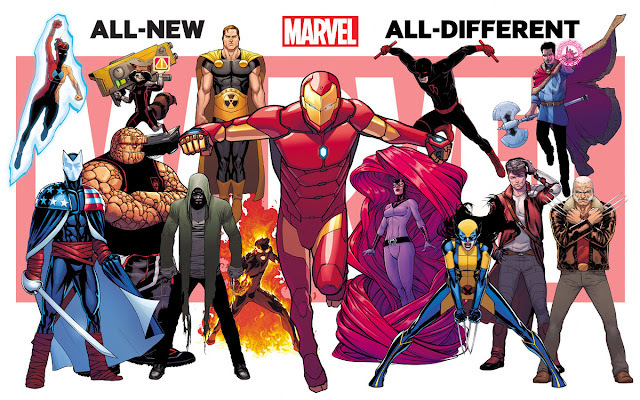 I guess for the sake of "diversity", specifically gender diversity, we get a female Thor and now a female Wolverine. Too early to tell and too early to be overly critical yet, but certain things just don't seem right just yet post-SW. I do like the new gimmick for IM though. He can turn into any past or current version of his armor at a moments notice depending on the situation? about time I figure. Thanks Dale! Yeah I think it's problematic for any company when the public can guess what you are going to do to your product. Cap, Thor, Wolverine, Hulk all having someone new behind the mask at the same time could give the perception you are no longer the House of Ideas you once were. For me it doesn't dent the waters though, as I'm not a major character reader, and haven't been since JRJr came off Captain America. That's not where my interest is, so this does excite me, because it's not the headline acts I'm interested in. I've even tried to change this blog in that direction. Like I say above, Black Panther, Dr Strange, Daredevil, Vision and Citizen V get my pulse going. Each of these are awesome characters that have deserved more time in the sun, and while many owe it their chance to the upcoming movie/TV schedule, I really hope it works out for them.